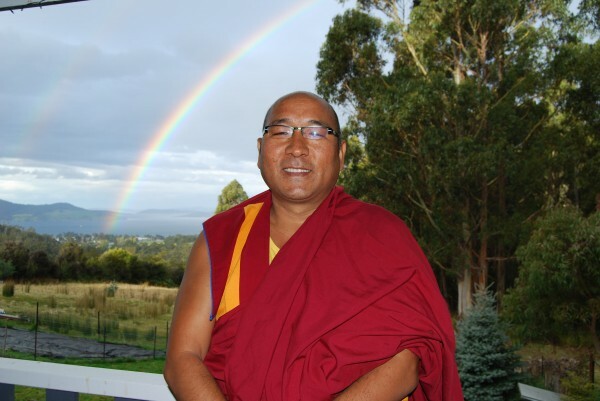 Geshe Sherab, Tasmania, Australia, August 2012. Photo by Kunchok Gyaltsen. Geshe Thubten Sherab was born in 1967 in the Manang district of Nepal. He entered Kopan Monastery at age nine. He completed his Geshe degree at Sera Je Monastic University in South India, followed by a year at Gyumed Tantric College. Over the last decade, Geshe Sherab has taught all over the world as well as serving several years as Kopan’s Headmaster. In 2012, Geshe Sherab spent three months touring the FPMT Australian centers, organized by FPMT in Australia. Mandala spoke with Geshe Sherab in October 2012 while he was at Kadam Sharawa Centre, located on the Central Coast of New South Wales, Australia. Mandala: What stands out to you as some of the big challenges for Western Dharma students or Dharma students coming from industrialized and more developed countries in the world? What are the challenges they face as they try to study Dharma and take on a Buddhist path? Geshe Sherab: The society they live in seems to be not as conducive of an environment to practice the Dharma. There are very few people who practice, so the conditions aren’t easy. Second, in the West, people grow up with material things and everything being so fast. And they can develop a kind of mentality that wants the result of spiritual practices to come quickly. When they don’t see the result fast enough, it seems to be quite easy for them to give up their practice. These are some of the challenges that I see. But at the same time, for the people who have found the Dharma now, I think there is more support from the Dharma community than those that began in the early 1960s or ’70s. There is continuously growing interest in Buddhism and more and more Dharma centers and practitioners. And definitely with time, it will change even more and become easier. Mandala: Are there advantages that Westerners have in terms of studying Dharma? Geshe Sherab: Yes, absolutely. One of the advantages they have is that most have a good basic education, so when you explain the Dharma, I think it much easier for them to understand and to really get the essence of the Dharma. They are more interested in meditation and the essence of the Dharma than the ritual aspects. I believe that is good, it’s an advantage I think. When someone gets too into the ritual aspects, sometimes it is possible that he can lose the essence of the Dharma. Westerners also come with a bit of a skeptical mind and I think that helps them too. When you come with that kind of skepticism and doubt, you take more caution, you reflect more, you contemplate more, and therefore you can develop greater understanding and knowledge. Mandala: What is it like for you to do teaching tours and visit different FPMT centers? Geshe Sherab: It is good. Most of the centers I am visiting are small centers or study groups. Only a few of them have resident teachers. I see the huge inspiration and encouragement that they get when a teacher comes. I am very happy to visit and help those centers that seem to struggle to find a resident teacher due to finances or whatever other challenges. One thing is that many of the students at those study groups or centers have not met Lama Zopa Rinpoche and one of my duties is to connect those people with Rinpoche. Even though Rinpoche has been unable to visit those study groups or centers, I encourage them to take teaching with Rinpoche in other nearby places. I feel quite blessed to be able to do that. I get a lot inspiration for myself from these visits. People who are trying to learn in those study groups can struggle and feel like they do not have enough support – human or financial – but still they never give up because they know that it’s going to help a lot of people. They never give up, and they have this kind of incredible courageousness, perseverance and patience not to close down, but to continue on. It is great to see that as well. I’d like to see more support from the bigger centers and groups to smaller groups, especially in the initial stages, when the study group or center is struggling from every perspective. I know that the bigger centers also have their own problems. But still, when compared to the study groups or small centers at the very beginning stages, they could lend a hand. I think that would be very good for the organization in general. Keeping connected with Lama Zopa Rinpoche, who is spiritual director of all of the FPMT centers, is very important. We are very fortunate to have met a guru like Lama Zopa Rinpoche, who is totally dedicated to others and us, and nothing else. It is not easy to find such a teacher in our degenerated times. We’re extremely fortunate. To work together in harmony and help each other, as part of the same mandala – being the same students of the same gurus – I feel is necessary. Working together in harmony is one of the most important things for the success of the organization as well as for the long lives of our gurus. Mandala: You’ve been teaching for quite a while now, but it seems like your generation of Kopan monks – Khen Rinpoche Geshe Chonyi, Losang Namgyal Rinpoche – is taking on lots of responsibilities. Geshe Sherab: I feel great that I’ve been able to share and give back something to the organizations and institutions where I studied and grew up and to be able to share whatever small knowledge I might have with students, whether Western or Eastern. I’m very happy to see that now a lot of monks and nuns from Nepal and India are taking responsibility for the revival of Buddhadharma, which has been declining to some extent. Because there weren’t enough educated teachers in Nepal, Buddhism has never been much more than rituals. I think now people are beginning to understand more and more the true essence of the Dharma instead of just the rituals. In many parts of Nepal and India, more people are developing understanding and are able to study. Now there are more and more people educated in Dharma, and not only from Kopan, not only from Gelug lineage, but from all the lineages. Now I really see a true revival of the Buddhadharma in the Himalayan region in Nepal and India. I think it is great to see that. It is a great feeling to see that.